Theme: What is the future of Pakistan-USA Relations and Democracy in Pakistan? Day, Date & Time: Tuesday, 21 June 2011 - 12 PM to 5 PM. - Discussions by Renowned Scholars and Pakistani-American Community Activists. Congress Members (Senators and Representatives). 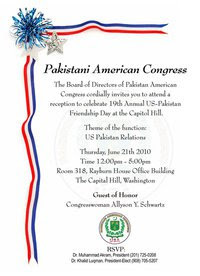 Guest of Honor: US Congresswoman Allyson Y. Schwartz. We look forward to meeting you at this PAC event.